Facebook announced several changes to Facebook ad metrics that will impact the results advertisers see and how they see them. 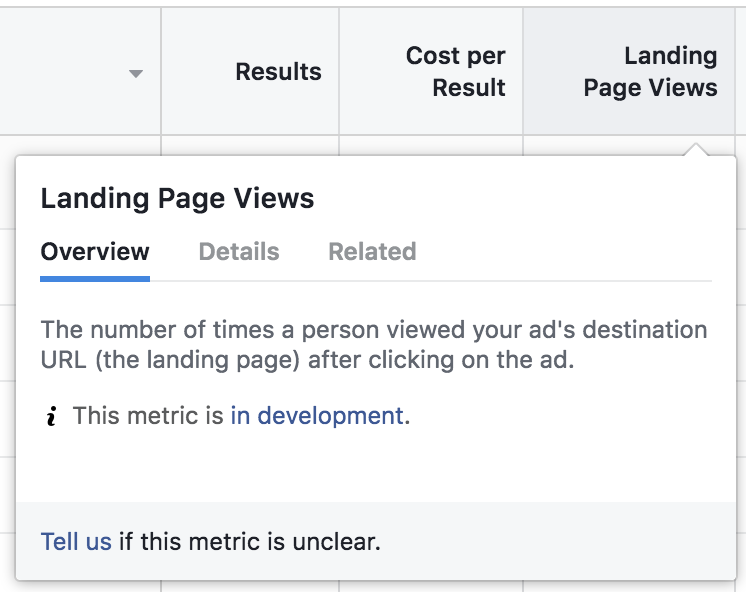 In an attempt that Facebook says improves transparency, certain metrics will be labeled as “estimated” or “in development.” You’ll find these labels within tooltips that provide more information. Facebook uses Reach, the most famous (or infamous?) Facebook metric among marketers, as an example for explaining estimated calculations. 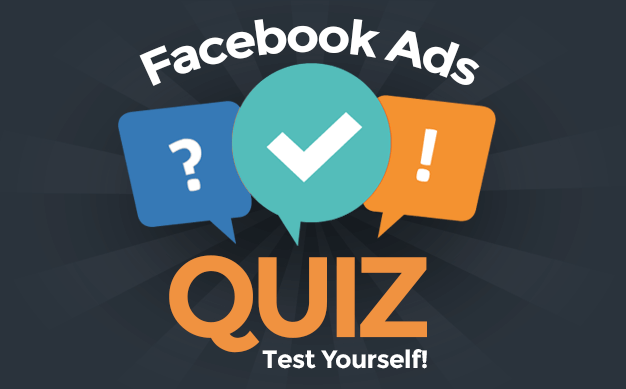 For example, reach is an estimate of the number of people who saw an ad at least once. 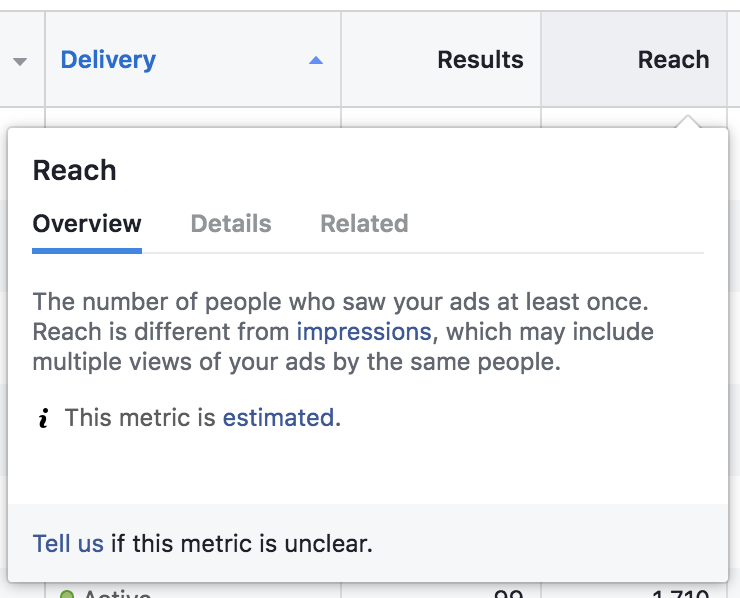 In order for us to report reach, we analyze the number of people who see an ad multiple times, de-duplicate them and then calculate the total number of unique people in real time. To do this quickly, we sample the data and will therefore label it as estimated. I’ve always considered Reach an inexact, low priority metric. This is the first time, however, I’ve seen Facebook describe it as being an estimate. To clarify: Being “estimated” doesn’t mean that a metric is wrong and can’t be trusted. Instead, I’d simply see these metrics as those that add to the story and provide context but are lower on the priority list. There are also several newer metrics that Facebook says they are testing and are therefore labeled as “in development.” Since these metrics are new and in the process of being tested, they may still change. Similar to the “estimated” metrics, understand that these metrics are being tested and may be imperfect. Instead of Actions, People Taking Action, Cost per Any Action: Customize your own composite metric reflecting actions that are meaningful to your business. Instead of Amount Spent Today: Select Today for the date range and use the Amount Spent metric. Instead of Button Clicks: Link Clicks, Event Responses or Offers Saved. Instead of Canvas Component Time Percentage: Canvas View Time and Canvas View Percentage. Instead of Carousel Card breakdown for conversion metrics: Link Clicks metric broken down by Carousel Card and see conversion results without the Carousel Card breakdown. Instead of Link Click Destination: Outbound Clicks and Landing Page Views. Instead of Mobile App Actions Conversion Value: Specific app event conversion values (ex: Mobile App Purchases Conversion Value). Instead of Page Mentions, Cost per Page Mention: Page Likes or Page Engagement. Instead of Page Tab Views, Cost per Page Tab View: Page Likes or Page Engagement. Instead of Positive Feedback, Negative Feedback: Relevance Score. Instead of Social Reach, Social Impressions, Social Clicks (All), Unique Social Clicks (All): Reach and Impressions. Do you see think these are positive changes? Any metrics that you don’t want to see go away?